SEVERAL YEARS AGO, before my son-in-law married my daughter, I gifted him with How to Talk Minnesotan by Howard Mohr. It’s a rather humorous, but truthful, volume of Minnesota Speak. 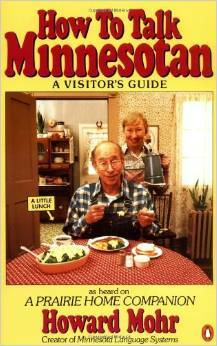 The original version of How to Talk Minnesotan was published in the 1980s. This is the version I’ve read. I thought Marc might need a Minnesota “dictionary” given he grew up in California, where bars are drinking establishments and not also a sweet treat baked in a cake pan. And, yes, he now lives in Minnesota with his wife, my eldest. Having ever only traveled as far west as one mile into Wyoming, never down South and to the East Coast only once, during college, I am mostly unfamiliar with regional differences in dialect. Apparently we Minnesotans draw out our “o”s and possess a distinct accent. No, not like the “sure, ya betcha” voices of Fargo. The son noted this on his recent arrival home from Boston for holiday break. “Listen to yourselves,” he advised his dad and me. An updated version published in 2013 by Penguin Books. Continuing along his Minnesota differences theme, the son noted also that we use the word “supper” to reference our evening meal. My husband and I explained that this is a carry-over from our rural backgrounds. The noon meal was dinner. Lunch was served at 3 p.m. to the men in the field and a “little lunch” around midnight, when you had company (aka visitors). Supper was served either before or after the evening milking. After nearly 60 years of identifying meals as breakfast, dinner, lunch, supper and a little lunch, we’re not going to change our dining terminology. He shot me that c’mon Mom look youth sometimes reserve for parents, then explained. Rather than filling the sink with water, each item is washed individually with a squirt of soap under running water. You are so correct! Midwesterners can be picked out anywhere. I didn’t realize this until our first trek out of this area (you may choose ANY direction, it doesn’t matter!!!) and someone will say….”Oh, you are from the Midwest/Minnesota!”. Yes, it IS that pronounced and the other characteristic (pointed out more when we were on the East Coast) is that we, here in the Midwest, walk down a public sidewalk and actually make eye contact with those passing AND……wait for it……may even smile and give a “Hello/Hi”!……almost unheard of elsewhere!!!! But, if these are our traits……I’m proud to be singled out as ‘owning’ them, aren’t you??????? Yes, I am. A proud native Minnesotan. An individual squirt of soap under running water sound extremely wasteful don’t you know. That sounds an awful lot like letting the water run full blast while brushing your teeth. Water is too precious to be wasted so blatantly like that. I agree. I hope it’s not truly a Boston way of washing dishes, but just something those in my son’s circle of college friends do. Wasteful, for sure. I had no idea you could wash dishes more than 200 ways. Now that is interesting. Now that last sentence you wrote is interesting. I would not have thought dishwashing to ignite arguments. I love to hear people from different areas of the U.S talk. My # 4 child married a southerner 30 some years ago. (Mississippi) Talk about a foreign language!!! My 2 grandchildren are sometimes really hard to understand. I used to tell them “slow down, and enunciate.” They did get better after college. Chiming in from Virginia via past lives in both Massachusetts and Minnesota. I never heard the Minnesota accent until I lived in Mass. for several years and then went back. I heard it then but with great affection which was not the case for the nasal, barking sound of the Massachusetts accent were my name was pronounce Baaaahbra. I can assure you that people in Mass. don’t wash their dishes as your son’s roommates do. That’s gotta be a kid thing. Fun post, Audrey. Hey, you’re lucky, you have a first name that can’t be mutilated in any region of our fair land. You are welcome, you semi-Canadian, you. Great comments! Being a displaced Minnesotan I too call it supper. I also say pop as apposed to soda, a shopping cart as apposed to a buggy, a jacket as apposed to a pakaa and while I grew up with snowmobile here in Alaska it’s a sno-machine or sno-go as apposed to a snowmobile. As for washing dishes well I use a dishwasher but grew up with one sink full of soapy water and a second sink to rinse in. Do the clear glasses first, plates and other items next with greasy cooking pans last! Hummmm I truly do miss some of the good conversations I have had while doing the dishes with mom, dad brother etc. I’ll have to look for the book. It sounds like an enjoyable read! 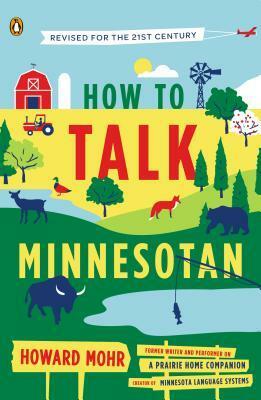 You would appreciate the book How to Talk Minnesotan, Don. I have not seen the updated version, but need to check it out. I remember traveling to the East Coast during college and asking for pop at a restaurant. I got this blank stare. Have not heard of the other words you listed here. Thanks for your comment. I’m always learning. I was in the South and asked for Unsweetened Ice Tea – talk about a face of disgust from the server – ha! I can only imagine. Tea without sugar? As an interpreter, I encounter Spanish-speaking people with many different dialects. It makes it challenging when someone from Mexico will use a different word than say, someone from Puerto Rico. And then there are people who will mix Spanish and Spanglish. It’s a continuous learning process. Thanks for those insights, Miranda. You would definitely be in tune to language differences because of your job. I’ll need to make note of that “soda” usage in Wisconsin. I wasn’t aware of that. Minnesotan accents… consider yourselves blessed! People from other regions may not always understand what you mean, but at least they understand what you say. That’s because, as a general rule, midwesterners enunciate words correctly. After living in Oklahoma for 2 years, I found it very difficult to say the word “hill” (always came out “heel”). I quickly recovered my lost ability after moving to North Dakota. My son, who obtained most of his vocabulary while we lived in OK, used to pronounce “corn” with two syllables (“cor-in”; likewise, “horn” was always “hor-in”). We found it very entertaining! I’ve also picked up other regional language habits along the way, some of which would not please my old English teachers. These days, when someone asks me if I can do something for them, my response is likely to be “I might could do that.” How attrocious! I lost my New England accent within minutes of moving to Texas! The words that are most conspicuously used in Massachusetts are “soda” or “tonic” instead of “pop,” “bubblah” instead of “water fountain” and “hero” or “grinder” instead of “sub.” I still use soda rather than pop. I rarely hear “pop” used anywhere outside of the midwest. In the deep south, “pop” is “coke,” regardless of the flavor of soda you are drinking. Now that takes some getting used to! BTW, when we recently toured the Coke museum in Vicksburg, MS where Coke was first bottled, we found out that “pop” came into usage only after the bottling industry came into being. It came from the popping sound made when the corks on the soda bottles were removed. Lots of info packed into your comment. I’ve learned a lot, especially about Oklahoma accents. I’ve heard of the soda/pop/Coke usage, but never knew the source of the word pop. Now I do. Thank you, brother-in-law. It’s funny to think of the things that we consider normal, like the way we talk and what we label our meals….everyone else is wrong… right? Always happy to make a reader laugh. Having grown up as a second generation Swede, my vocabulary was interspersed with Swedish names for things around the farm! We always called calves, “cuzzies” for instance. And the whole soda vs. pop vs. coke…spent some time as part of a teacher’s project on the East Coast…that was a whole new vocabulary! I always thought curlers were something you put in your hair…until I ran into crullers (a fried pastry popular in New England)!! Cuzzies, now there’s a new one. This has been fun, to learn more about the differences in words based on region. Thanks for chiming in from Colorado. I grew up in Mankato, but moved to Canada in the early 1970s. After a couple of decades, going back and forth to visit of course, I first noticed an accent peculiar to young men in Minnesota, something I call the Minnesota Quack. Can’t describe it better than that, and I have no idea how it originated. It’s how one of my brothers talked, and when I heard the same quack in a shopping mall one day I thought it was him. Nope, it’s a “thing” with many young guys. A quack? Now that’s a new one when linked to the Minnesota accent. Seems more like the “valley girl” accent, not something tied to locale, but picked up some other way. We need to ask a dialect professional, I think.